Today also marks the 37th anniversary of one of the first attempts to restrict reproductive rights: the Hyde Amendment, a law that bars states from using Medicaid money to fund abortion. Many poor people rely on Medicaid to pay for their health care. So while it’s true that the Hyde Amendment does not, technically, eliminate the right to abortion, it renders that right largely meaningless for the many poor and low-income women who simply cannot afford to pay for an abortion on their own. For such women it amounts to a legislative repeal of a constitutional right. 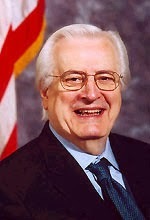 The late Rep. Henry Hyde, R-Ill., author of the Hyde Amendment. And as we show in Roe at Risk, while the federal government took one of the first steps to cut off access to abortion 37 years ago, states have been following suit ever since. In recent years, some state lawmakers have been transparent in their attempts to deny access to abortion, directly attacking the right with legislation that makes abortion unlawful after a set period of time. Such attempts have taken the shape of bans that begin at twenty-weeks, at twelve weeks or at six weeks. In other states, restrictions on access to abortion have been more insidious. One of the popular approaches is to pass “TRAP” laws, which stand for “targeted regulation of abortion providers.” These laws often require abortion providers to attain admitting privileges at a local hospital, or require abortion clinics to meet the same standards as hospitals or ambulatory facilities. TRAP laws are passed under the pretext of protecting women’s health and safety, but in reality they are thinly veiled attempts to shut down abortion clinics. For example, hospitals typically are not required to grant admitting privileges, and if they oppose abortion, they do not have to grant admitting privileges to abortion providers at all. Moreover, the requirements to attain admitting privileges vary and may be impossible for abortion providers to obtain for reasons wholly unrelated to health or safety. Predictably, abortion clinics often cannot meet the laws’ unnecessary requirements, and then they are forced to shut down. When clinics shut down, women are left stranded. Ultimately, these TRAP laws have one purpose and one effect: to end abortion in the state. Hyde Amendment: Legislating Inequality for 37 Years. Still Remains Out of Reach for the Poor.